Tips and tricks on maintaining Stitching Heads. One of the biggest performance let downs on a modern high speed saddle stitcher is the actual stitching head maintenance. Poor maintenance will result in failure of the heads ability to feed the wire and resulting not only down time from a damaged stitcher head but in the decollating and production repairs to the rejected work where the work can be rejected, or more time consuming repairs to already trimmed products that have been through the trimming process. Stitching heads have some critical areas that need to be maintained weekly and checks to be carried out daily to ensure heads have a trouble free operation and a long producing life span. Simple mechanical knowledge will be required to strip and clean service repair and lubricate the stitcher head. There are different models of heads from different manufactures available and so please consult the manufactures instructions for the correct method for the specific head being serviced. You can feel free to contact our service department for any assistance needed with stitcher heads from our stable of machinery. We will gladly quote and assist with repairs, while our spare parts department stock replacement parts for our supported heads. In these posts I will cover some critical areas of maintenance and will start with the areas that are often neglected, cleaning and lubricating the stitcher head. Cleaning is important as you will not see visible wear and possible areas where damage and failure might and often will occur. Check for wear on the friction areas on the clutch and break system and on the components where the wire travels. 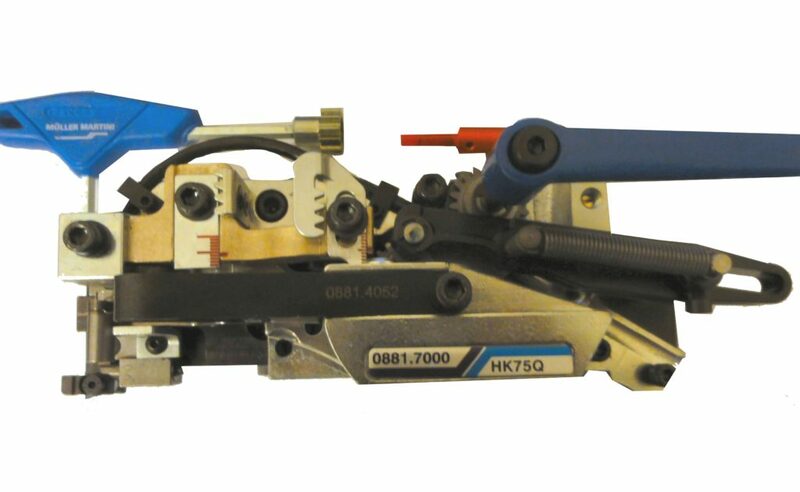 Formers and drivers of the actual staple must be clean of debris and adequate clearance for movement on the driver and gripper in the formers where the staple is formed and driven into the book being produced. Ensure to use clean lint free cloths where contaminants cannot foul up the head and moving parts. Lubrication of the head and components. *Lubrication chart will be available as a download document in the future. The clutch mechanism is the most overlooked component in the Muller Martini stitching head, here the correct grade oil is needed to lubricate the movement of the clutch but attention needs to be paid to the ease of over lubricating the clutch. This clutch requires a light coating of oil on the clutch contact areas. Here too much lubrication will result in the clutch slipping and the wire feed will be erratic in length and this will result in hours of wasted time trouble shooting on the machine. Muller Martini recommended oil chats indicate* oil 4 (HLP 46) for the heads and clutch areas, gear and automotive oils are too thick and have the wrong characteristics for this type of lubrication needs. Lubrication of the moving parts of the head should all be carried out after any form of cleaning care should be taken when using solvents where stubborn dirt is to be cleaned as some solvents can be corrosive to the parts of the head. Moving parts cleaned should be well lubricated. Over lubricating will result in oil being transferred and in extreme cases oil being dripped onto products, please to lubricate where needed and not to over lubricate. Where on drop of oil is recommended by the manufacture per 8-12 hours of use do not use 2 to 3 drops. The felt pads of the wire guides are to be lubricated with the recommended oil as to ensure wire is cleaned and lubricated for the forming and completion of the staple stage of production. After familiarising yourself with these simple steps and following the manufactures instruction you will no doubt have trouble free service from you Stitcher heads on your Muller Martini Stitching line. Should you feel you need assistance do not hesitate to make contact with our service department through this website.